As white as jade, as thin as paper, as bright as a mirror, as sound as a bell. Porcelain is dense, vitrified, white and translucent ceramic ware that I consider to be a refined cousin of stoneware. 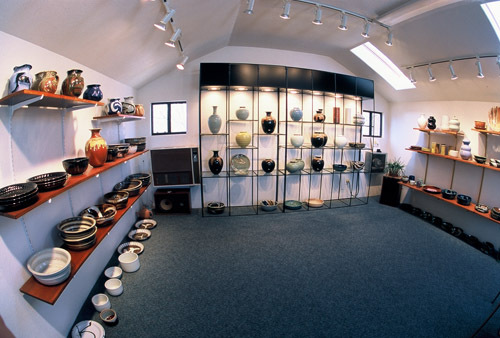 High fire stoneware and porcelain wares are fired to nearly 2400 degrees Fahrenheit, but in contrast to stoneware, a porcelain clay body is made of only fine and pure materials and is very simple in composition, consisting of clay, (kaolin), silica, flux (feldspar), and a plasticizer. At top temperature porcelain is very close to becoming glass. This is because a porcelain clay body consists of only very finely ground materials that are therefore able to melt in a very complete and homogenous way. Glazes are also a form of stiff glass, and porcelain is unique in that the body and glaze mature together at 2400 degrees to create a thick body-glaze layer that can give the whole piece an important strength. The whiter the kaolin used to make the clay body, the greater the amount of clarity the glazes can achieve when reflected against the whitest possible background. The name kaolin comes from the Chinese word kao ling, or high ridge, where the original deposit of white burning clay was discovered near Jingdezhen, the center of porcelain production in China. Often I hear people recoil at the daunting challenge of using porcelain on the potters’ wheel, and it is true there is a point of diminishing returns when trying to cajole porcelain clay into tall forms on the wheel in comparison to using far more workable stoneware clays. With testing, diligence, a willingness to make a clay body that works for your own individual needs and decades of experience, all barriers can be overcome. 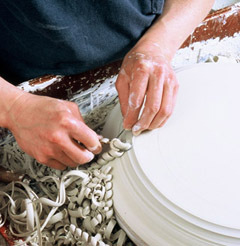 Mastering porcelain clay is the work of a lifetime. Nothing else can or will suffice. The name porcelain was coined by Marco Polo in the 13th century from porcelino, the name of a translucent cowrie shell that looked like a little pig, or porcelino. He likened Chinese porcelain to this translucent white shell. You can see and feel the fine white smoothness of the porcelain clay body on the foot or inside of a lid of one of my pieces. Enjoy.